A delicious traditional Greek ‘Tiropitakia’ recipe suitable for every time of the day, as starter or mid-day snack! To prepare this traditional tiropitakia recipe (Greek feta cheese triangles) we crumble the feta cheese and mix it with two different kinds of yellow cheese for extra flavour. 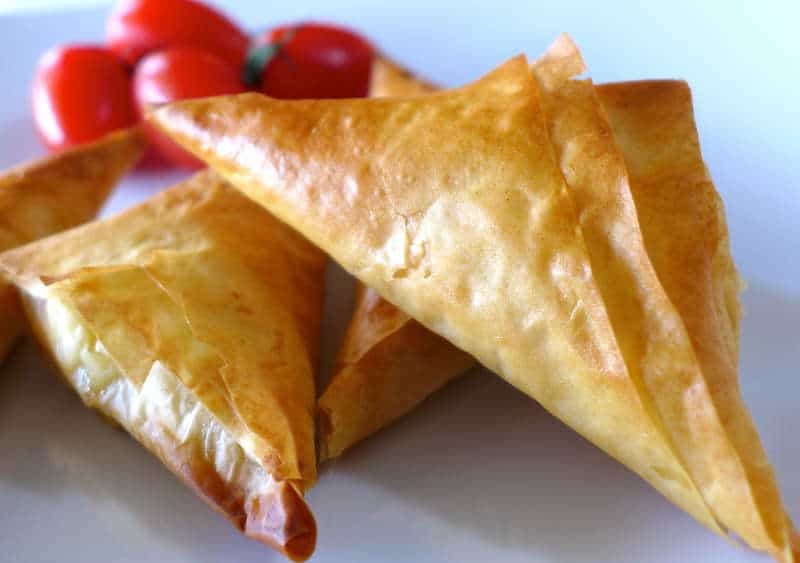 We then wrap them with phyllo pastry forming a triangle, brush with melted butter or olive oil and bake them until golden and crispy to perfection.. Simply delicious! Greek feta cheese pies, rolled into individual servings (tiropitakia) are very popular in Greek cuisine and come into a variety of shapes. They can be made as individual rolls, half moons, little croissants or triangles. The main ingredient you will need to make this phyllo dough triangles (tiropitakia) is of course feta cheese which is a favourite ingredient in all types of Greek recipes, be it fried, baked or used for stuffing until nicely softened and slightly melty. A mature feta cheese gives this traditional tiropitakia recipe a bold and salty flavour, so be careful to just a little if no salt in the seasoning! Give this super easy and delicious Greek traditional tiropitakia recipe a try and amaze your friends and family with its crispy and tangy flavour. Oh and you can always read this in Greek if you fancy Η πιο εύκολη συνταγή για τυροπιτάκια! Enjoy! For the beginners at working with phyllo, check the handling tips before starting. To prepare the tiropitakia, start by preparing the filling. Crush the feta cheese into a large bowl and add the grated cheese, the egg, a splash of milk, and season with freshly ground pepper. Mix well with a spoon to combine the ingredients. (At this point you can add some chopped fresh herbs if you like; some fresh dill or mint will surely lift the flavour). Preheat the oven at 180C and start preparing the tiropitakia. Spread one sheet of the phyllo dough on the kitchen counter and with a cooking brush drizzle with some melted butter or olive oil. Spread one more sheet on top and drizzle with some more butter. Cut the sheets into three or four lanes (depending on if you like the tiropitakia to be small or larger). At the end of each lane add one tablespoon of the filling. Fold one corner to form a triangle and continue folding the triangle upon itself, until the entire piece of phyllo is used. Continue with the rest phyllo sheets and filling. Oil the bottom of a large baking tray, place the tiropitakia and brush them with some melted butter on top. Bake in preheated oven at 180C for 25-3o minutes, until golden and crispy. Serve this delicious Greek feta cheese triangles as a great starter with some Greek salad aside. Enjoy! Hi! Found you on StumbleUpon . This recipe looks delicious! Going to try it . Thanks!